Custom-built FERO waterfront home with 3 bedrooms/2 baths offering sailboat access to Charlotte Harbor. The home is situated on a bend in the canal and offers fabulous views in both directions. This spectacular home has that WOW factor the minute you enter the beautifully etched glass double entry foyer doors. Tile throughout with a gorgeous welcoming mosaic floor medallion customized and hand installed in the foyer. 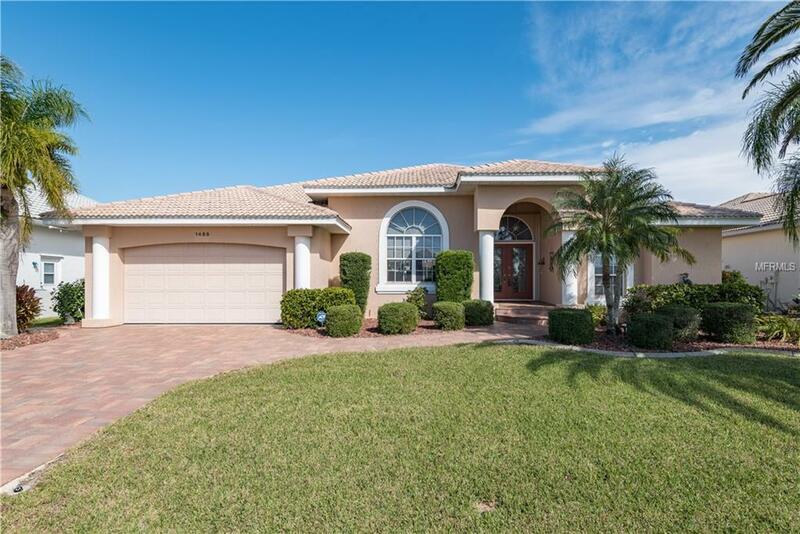 And the special treats are all out back - the view, the sailboat water, the location - minutes from Charlotte Harbor and the Gulf, the heated pebble tec pool and spa and the spacious lanai. The recently renovated chef's kitchen motivates you to entertain and this is the place to do it! The huge master bedroom suite opens to the lanai, features a gorgeously appointment bath and large closets. The guests bedrooms (one is set up currently as an office) enjoy privacy on the other side of the house and share a spacious guest bath. The two car garage has plenty of storage and the laundry room features a deep sink and lots of work room.